Rifle Basix currently manufactures high quality aftermarket replacement triggers for the Savage 110 rifle as well as the Edge/Axis rifle. We are currently the only manufacturer that offers a varmint / target type trigger for the 110. Currently the oldest continuously produced bolt-action rifle in America. The 110 was named because of its original retail price of $109.95. The 110 was the first ever left-handed bolt commercially sold. In 98 new numbering brought about the Model 10 for the short action and the Model 110 for the long action. The Savage Model 110 was originally designed for the hunting market, carrying the traits of strong, powerful and economical. SAV-1 with a 14oz – 3lbs weight of pull. This trigger is primarily used for hunting because of its weight-of-pull range. SAV-2 with a 4oz – 3lbs weight of pull. This is our universal Savage 110 trigger that is very versatile. This trigger does not support the AccuStock. Our triggers come with a hardware pack and adjustment wrench. We also have a online PDF installation guide as well as a SAV-2 video installation guide for AccuTrigger™ & Standard Trigger. Prior to 2003 many believed the Savage 110 trigger has a substandard design issue. In 2003 Savage introduced the AccuTrigger™ which provided a more adjustable trigger. This allowed for weight of pull adjustments between 1.5lbs-6lbs. We sell triggers for both the standard and AccuTrigger™. 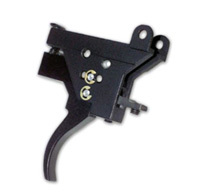 Browse our Full Line of Savage Replacement Triggers Online.